New Zealander-Canadian author Alice Petersen’s first collection of short stories, All the Voices Cry (Biblioasis) won the 2012 Quebec Writer’s Federation Concordia University First Book Prize. 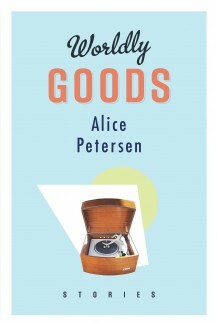 Her newest collection Worldly Goods (Biblioasis) was released in May. Brad de Roo asked her about the object of books and the music of objects for carte blanche this July. What do the objects that we cherish tell us about ourselves? What about the things we fear? In some of the stories in Worldly Goods I thought about those objects that we can not get rid of. Fear plays into that, for objects can embody fear as well as literally inflict violence. That nasty knife in “A Little Thank-you,” for example, is an object that reminds Marieke of a past that her family has escaped – she does not want it and what it represents in her house, and yet she can not think how to get rid of it. What kind of worldly good is a book? A book and its associated pleasures is definitely of this world, and at the same time a book contains invented worlds. So a book is very worldly. A book of course is the very best kind of worldly good, or at least I think so – existing through time, easily shared, nice to look at and to hold, and containing evidence of hard and sustained work. I like objects that reflect human work. All those human hours. And why do we do it? Beats me. That’s why the physical effect on people’s hands of knitting or stitching or playing instruments interests me – calloused and rough, ridged and engrained with grease or stained with ink – our hands reflect the amount of work it takes to create an object. Do you collect many books? I wish. No, I have a motley collection of much-loved paperbacks and a couple of library cards. What’s the most beautiful book you have ever seen? For me, the contents of a book are part of its beauty, so I think my favourite book in the world is possibly a first edition of Middlemarch. Imagine all the work that has gone in to making that book! The exquisite writing, of course, in the age before typewriters. Then the re-copying, the type-setting, the paper making, the binding, the marbled papers, the tooling on the spine…and imagine the first people lucky enough to read that book. What a thing that would be. Literary epiphanies often follow talismans embedded in stories. You rather wonderfully misdirect the reader from the obvious or initial talismans, while still utilizing the first object’s significance. What sort of deliberation goes into determining such a generative yet referential use of symbolical objects? Well, you know, I do try to tell the stories about the people rather than the objects. The objects are secondary, if anything. It’s what the object means or how it is used or abused by the characters that makes story. Even a story that sprang from an object – the opening lines of Elizabeth Parker’s sampler, for example – needed a human mystery to wrap around it, and that required characters in a state of tension with each other. Objects in themselves do not speak; it is humans who tell the story. Your stories move through a lot of Anglo-dialects (English, Canadian, American, Australian etc.). Do you ever find yourself in an uncomfortable or unfamiliar dialect? If so, what do you do wrangle a legitimate voice out of this situation? I would not write a story in which I could not hear a certain voice. Voice for me is like a key in music – it has to be relevant and consistent. Voice develops as I write, or sometimes it dictates, as in “Going Down to Hickory” in which the slightest of southern swings developed, because it would make no sense for me to tell that story with a New Zealand accent or vocabulary! The voice and its vocabulary, its cadence and its habits of thought is always integral to the telling. And sometimes the voice surprises, in that it says things that I would not say. I write in a very cumulative way, over time. I tell and retell, write and rewrite the story over a number of months, laying down the pages longhand, without looking back. And at the end I render down the essence of it into the computer, and I find that I have often said the exact same thing in the exact same words, but three or six months or even years apart. That’s the voice in which that story wants to be told. That’s the voice that comes naturally to that story. Music is a big part of some of these stories (especially ‘Music Minus One’ and ‘The Parisian Eye’). Is there something musical about ‘the voice in which the story wants to be told’? I definitely think about stories in a very aural way. When I was a little girl I listened to a lot of Beatrix Potter and Alison Uttley read aloud by Viven Leigh. She had a very musical delivery – she knew how to land a sentence. And of course paragraphs and stories have their development and progression, like music. In the story called “Dear Ian Fairfield” I was aware that the build-up of unresolved letters was somewhat excruciating – I had to feel for the right time to change into prose, to let out the tension. As I did that I was thinking about a piece like Barber’s Adagio for Strings and how the tension in that piece has to be relieved or you think your head might explode. Do your musical tastes influence your literary ones? Yes. I like classical music and I like the notions of key, voice, cadence, development etc., that frame up how music is discussed. These notions help me to consider, in abstract, the progression of a story, or the ways in which a story can be put together, beyond the linear progression of time. And sometimes I infuse a story with a specific piece, just because I like it. In “Music Minus One” the piece the cellist plays is my favourite – Tchaikovsky’s Rococo Variations. When I describe what Brian Fitzgerald sees as he hears it – the woman in the belted raincoat, out in the morning in air – I am writing what I see when I hear that introduction. And of course, the story is all about variations on a theme, told and re-told through time, just like a set of musical variations. Your editor John Metcalf is known as a champion of the Canadian Short Story? Do you feel like you are a part of this tradition, even though you hail from New Zealand? I am very happy to have started writing in Canada, but I really believe that the tradition of the short story goes on in spite of national or time-related boundaries. It is for academics and Arts Councils to describe stories in these terms. Writers are free to choose their tradition and their writing ancestors. They have to be. As a writer, I am formed by what I have read, just as much as I am formed by the physical landscapes I have moved through or the decades I have lived in. I like and thoroughly admire the short stories of New Zealand’s Katherine Mansfield and Janet Frame and Canada’s Alice Munro and Mavis Gallant, but I have read just as much Borges, Flannery O’Connor, Elizabeth Bowen, Tchekov, Nabokov and William Trevor. I am lucky that John does not seem to be bothered by my international approach to writing ancestors. As he says, quoting Mavis Gallant, his main concern is whether the story is dead or alive. He always lets me know his opinion one way or another. This entry was posted in à la carte and tagged Alice Petersen, interviews. Bookmark the permalink.